I feel like I’ve been living in a flower shop for the past week and a half. If you’ve been following Beauteeful Living on Instagram, you probably notice that over half of my posts are floral related. I cannot help it! 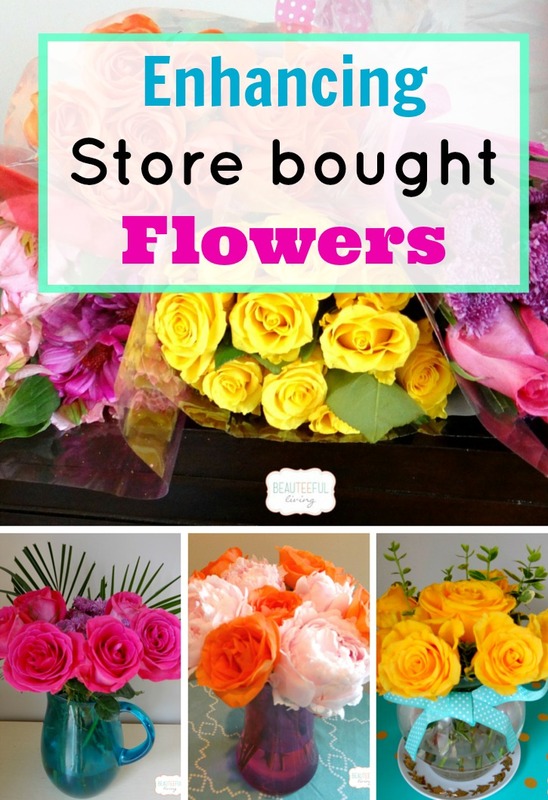 I….LOVE….flowers. Since the rose bouquet only came with the roses, I added clippings from the shrubs in our garden for pops of green leaves. 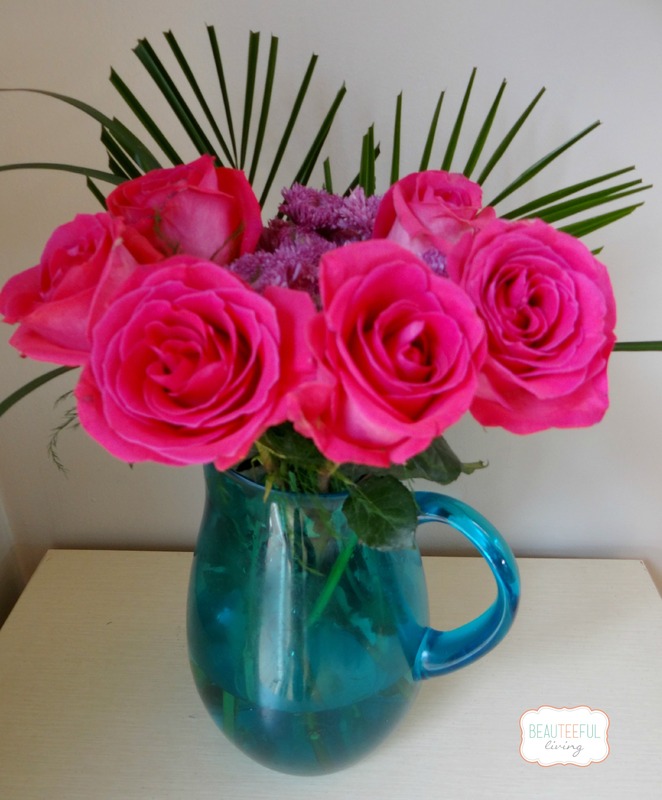 These were long stemmed roses that I cut short to fit in a small round vase. 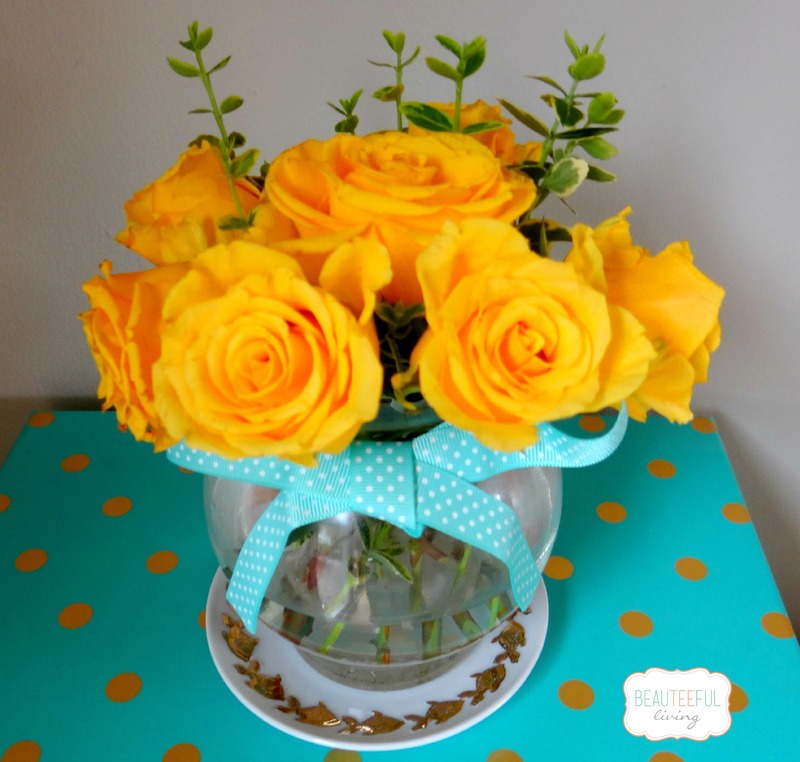 A pretty ribbon wrapped around the vase completes the look I was after. 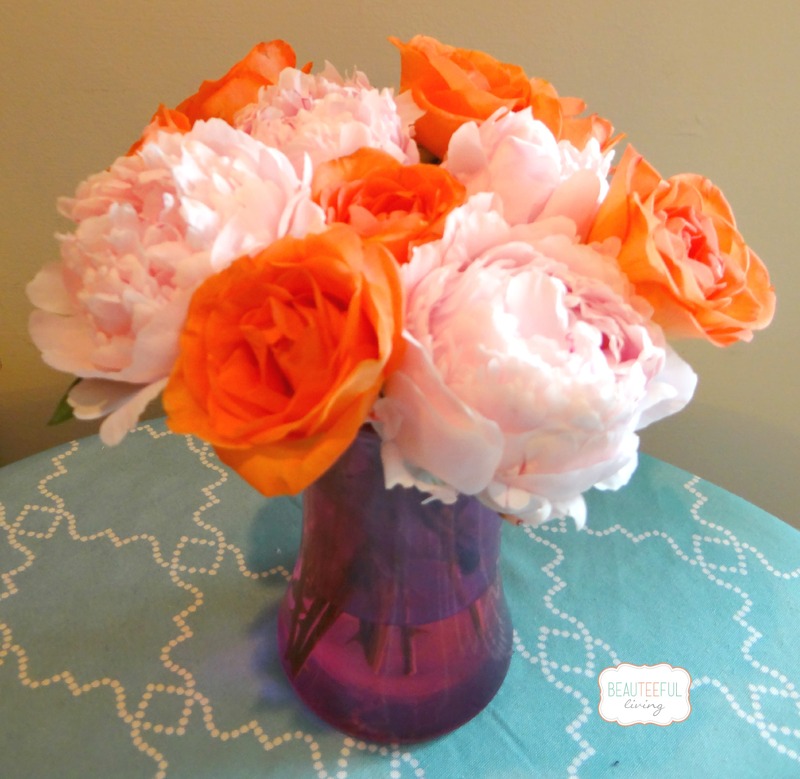 With the orange roses, I decided to pair them up with the peonies from our garden. 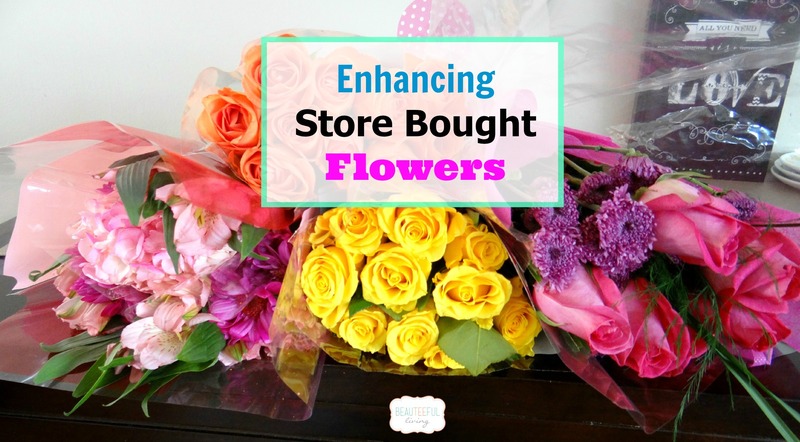 Who says peonies and roses can’t co-exisit? 🙂 I love the contrast of the pink and orange blooms. Look how fluffy! I didn’t have to do much with this pretty arrangement. All I did was clip the ends to allow better water absorption. Instead of placing the bouquet in a clear vase, I decided to place it in a blue pitcher. The pitcher was the perfect height for this bouquet. 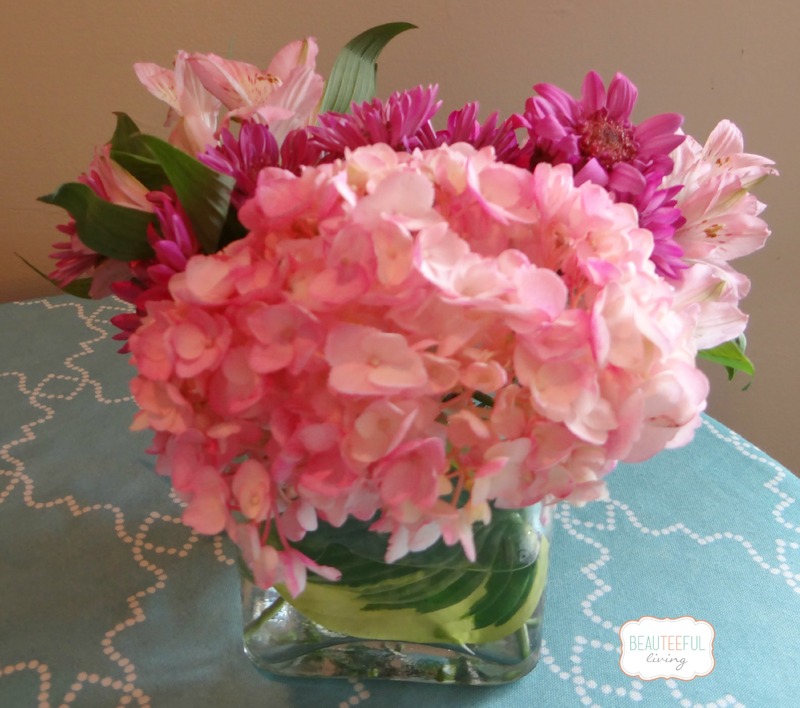 For the hydrangea and chrysanthemum bouquet mix, I decided to place it in a short, square-shaped vase. At the bottom, I added a leaf from our Hosta plant. It adds an extra touch of “tropical” to this look. As always, thanks for stopping by! Xo, Tee. P.S. Stay tuned for next week’s post on how our kitchen looks today (8 years after renovation)! Ooh I love peonies and roses! 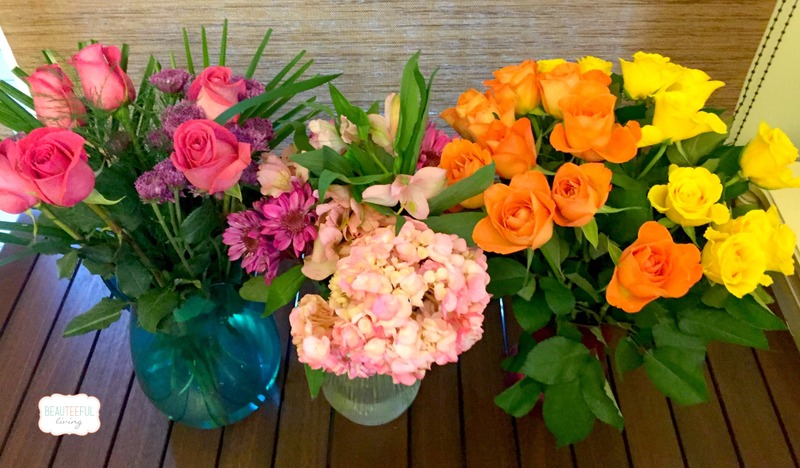 Your arrangements look gorgeous! I love the addition of the peonies to the orange roses! They definitely jazz it up! I love the orange blossoms and peonies! I wouldn’t have thought to mix them but they look beautiful! Thanks, Valerie. Yeah, it’s my first time mixing the 2 types. Love the combo now :). Thanks, Lauren! I bet those rose bouquets at your sister’s bridal shower were beautiful! Glad you got to enjoy some of them. Thanks for commenting :).